Do you want to make a quick escape to Snoqualmie Falls near Seattle? There are a number of ways to get there from downtown Seattle without a car. 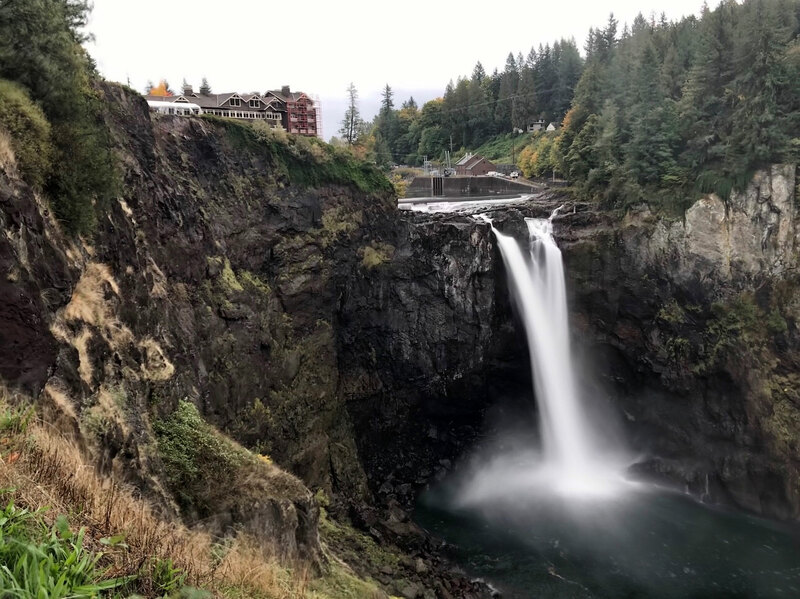 First, we like to think our Snoqualmie Falls and City tour is a pretty good value and we spend enough time to have you enjoy the viewpoint and take in some of Mother Nature’s beauty. We will even give you some photo tips to help you take better photos while you are there. 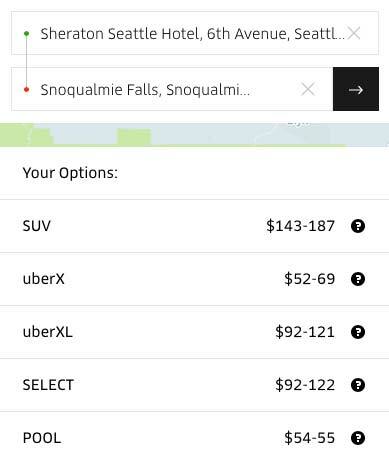 Uber will be your most expensive option as you can see by the above chart. This chart was created midday around 1 PM, surge pricing will be more. Keep in mind this is one way and you’ll have to hope to catch an Uber on the way back as well unless you can talk the driver into waiting. 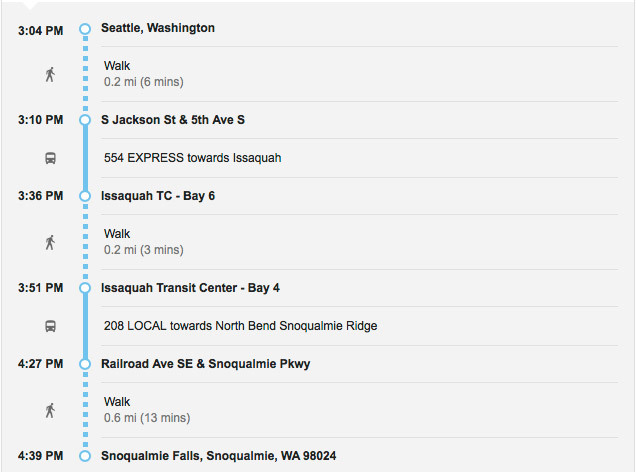 Bus service in Seattle is pretty good, but this bus route to Snoqualmie Falls will involve a bit of walking as well. Get off the bus at the stop near the old steam locomotive at the intersection of Railroad Avenue SE and Snoqualmie Parkway. Current bus price is only $5.00 each way. This schedule can change at any time and it’s best to consult the current route information. There are many town car and limo services in Seattle and prices vary wildly. We found this rate sheet from Snoqualmie to Seattle priced between $85-$95 each way. If you have a rental car, it’s easy to simply get onto Interstate 90 from Downtown Seattle and head east to Exit 25. Take a left off the exit and you’ll pass through an area called Snoqualmie Ridge. When you get to the bottom of the hill, take a left at the Railroad Crossing on Railroad Avenue and go across the bridge, the Falls will be on your left. Take the third exit in the roundabout and it will be on your left. As of this writing, parking is $7 near the giftshop, but park in the lot opposite the lodge and giftshops and parking is free. This entry was posted in Seattle Info and tagged Seattle, Snoqualmie Falls. Bookmark the permalink.